In a move that makes him the clear contender for dad of the year a dad in America (Not America but rather a commonwealth country as he spelled honour and rumour correctly and Remembrance Day is a commonwealth day. More thank likely this happened in the UK It’s Canadian, thanks everyone for the updates) has sent a note to school to excuse his daughter from a massively boring Remembrance Day assembly as she’s required at home for something massively important. Not only that but he continues to say she may be needed to be excused for the entire week as the war is not yet won. 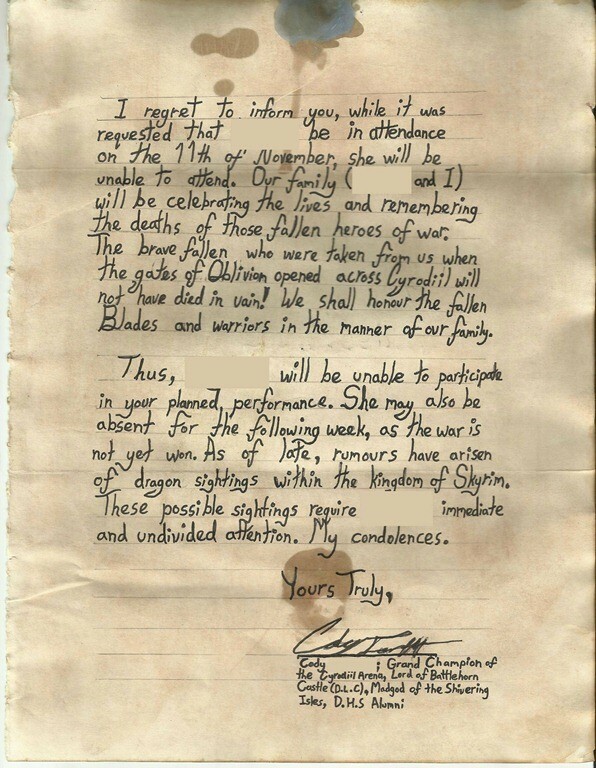 This guy deserves a medal for taking gaming so seriously and we wish him and his daughter all the best in their quest to rid Skyrim of the evil dragons.